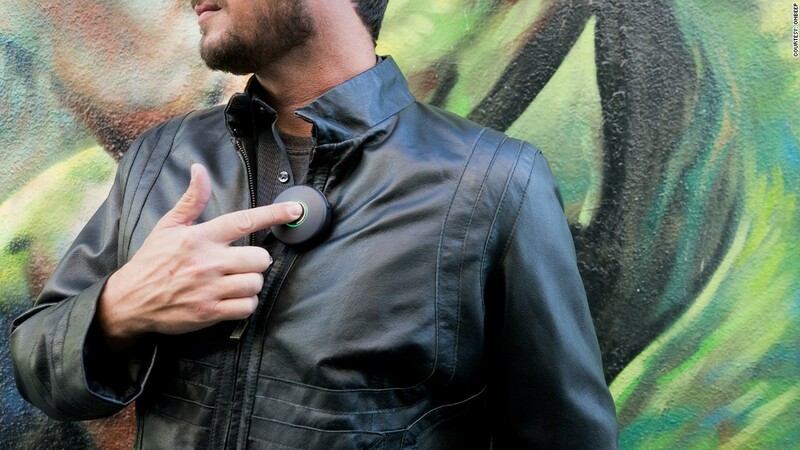 Onyx is the real-life Star Trek communicator badge, just like the one Captain Picard and his crew wore on the Enterprise. When Star Trek's Captain Picard presses his communicator badge, he can instantly speak with any member of his crew -- even when they've beamed down to a planet or a nearby spaceship. A company called OnBeep has made the Star Trek communicator badge a reality (well, except for the spaceship part). It even looks like the real deal. Founder Jesse Robbins believes Onyx will be popular with first responders and event staff who can't look down at their phones to place calls or respond to text messages. "Cell phones are terrible for short messages and real-time communication, because they take you out of moment," Robbins said. Communicator technology has technically been around for two decades. Nextel's nationwide push-to-talk technology debuted in 1996, turning cell phones into extremely long-range walkie-talkies. But texting and unlimited cell phone minutes killed push-to-talk, and Sprint (S) shuttered the Nextel brand last year. But instant voice communication is making somewhat of a comeback. Apple (AAPL) just introduced voice messaging as part of iMessage, and Facebook's (FB) WhatsApp recently added voice to its texting app as well. OnBeep thinks Onyx can also help revitalize digital voice tech, which Robbins calls "the most powerful way of communicating when you're not face-to-face." Robbins envisioned "countless" uses for the technology, including families and friends staying in touch. For example, spouses might use Onyx when one person goes to the supermarket and doesn't want to call home a dozen times to ask if the pantry is stocked with various products. But the audience for Onyx might be limited. The badge goes on pre-sale Wednesday for $99 (and $195 for two). That's not going to break the bank, but it's expensive enough that you'll really have to want it to buy it. And you'll have to convince your friends, family or coworkers to buy Onyx too -- it only works if you have other Onyx owners to talk to. Even if it doesn't take off, we can add Onyx to the growing list of Star Trek-inspired technology. There have been several attempts to build a tricorder, a holodeck, a food replicator and -- the Holy Grail -- the ask-and-answer computer system. Yet only a small number of these Star Trek innovations are actually available today. There are doors that open automatically when you approach them. Now we can add communicator badges to the list. We'll let you know when warp drive is here.